Mr. PAUL. Mr. Speaker, I rise today to pay honor to my long-time friend, Nolan Ryan, on the announcement of his election to the Baseball Hall of Fame. Ive known Nolan for many years, and I knew him as a kind, generous man who seeks to do what is right and just. It seems there are so few heroes for kids today, especially in athletics, but I can sincerely commend Nolan Ryan as a true hero of our times, a role-model for our youth, and a man worthy of honor and respect. Nolan was born in Refugio, Texas, a historic town in my congressional district, but he was destined for the national stage. His successful career spanned 27 years, taking him from rural Texas to the dug-outs of the New York Mets, the California Angels, the Houston Astros and the Texas Rangers. He pitched a record seven no-hitter games, but his real fame comes from having pitched 5,714 strikeouts. Nolan told newspaper reporters yesterday that he never viewed himself as a hall of famer. For once, I have to disagree with my friend. He is Hall of Fame material not only for his prowess on the field, but for his strong character and unwavering dedication to his family, his friends, his beliefs, and his God. I trust all my colleagues join me in congratulating Nolan Ryan. 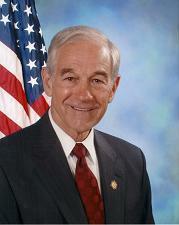 1999 Ron Paul 2:2 congressional district probably should be capitalized: Congressional district.